Half a boneless acorn paleta. Minimum weight: 750g. Cured in Corteconcepción, denominación de Origen Jabugo, this vacuum packed product comes from Iberian paletas divided in two and deboned. Iberian acorn paletas are cured in cellars for one year less than hams because of their weight, but they are no less tasty for it. One of the secrets of unique and inimitable taste lies in the environment in which Iberian pigs are raised: the meadow. The natural park of the Sierra de Aracena y Picos de Aroche is a unique geographical area populated with holm oaks, cork oaks and oaks where the pigs are free to roam and eat acorns (especially between October and February). Generally, a whole paleta weighs between 4 and 6 kilos. After being boned and having the excess fat removed, the piece is half its original weight. With a boned Iberian acorn paleta you can enjoy a high quality product, which is easy to cut it and keep. This piece is sold as a boned piece and vacuum packed. Weight between 750g and 1.3 kilos. Denominación de Origen Jabugo. 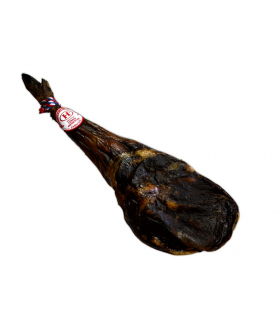 Red label: 50-75% Iberian breed. Store in a dry and cool place, away from direct light.